Admissions Open at The University of Lahore's undefined for the batch Spring 2019. UOL offers admissions in different fields of study for Bachelor and Master Programs. University DescriptionThe University of Lahore believes in delivering excellence in research and learning. Our ability to add to your academic and social skills will allow you to lead in your professional career. We aim to create high-quality graduates who are practically skilled to enter the world of work. 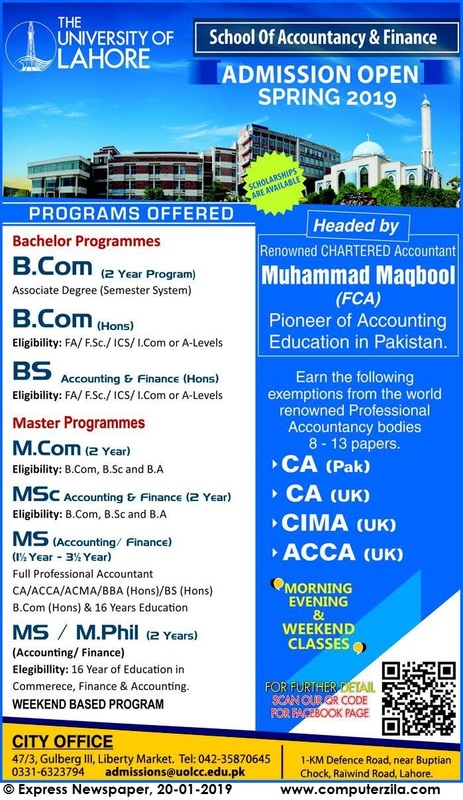 The University of Lahore is recognised as the largest private sector university of Pakistan, and there is no better time to join the university when it is expanding internationally with campuses and networks being developed across the world. We believe in commercialisation and entrepreneurship and have invested in the establishment of enterprises in order to ensure that our students gain hands-on experience that actually matters for graduating students. Our academic standards are high and we believe in encouraging independent thought driven by creativity and critical insight. You will experience our faculty that is one of the best in Pakistan and believe in research and expression in academic terms.